You can linearize a block or subsystem in your Simulink® model without defining separate analysis points for the block inputs and outputs. The software isolates the selected block from the rest of the model and computes a linear model of the block from the block inputs to the block outputs. Linearizing a block in this way is equivalent to specifying open-loop input and open-loop output analysis points at the block inputs and outputs, respectively. For more information on specifying analysis points in your model, see Specify Portion of Model to Linearize. This example shows how to linearize a plant subsystem in a Simulink model using the Linear Analysis Tool. For this system, the Water-Tank System block contains all the nonlinear dynamics. To linearize this system, open the Linear Analysis Tool, and select the block as a linearization I/O set. 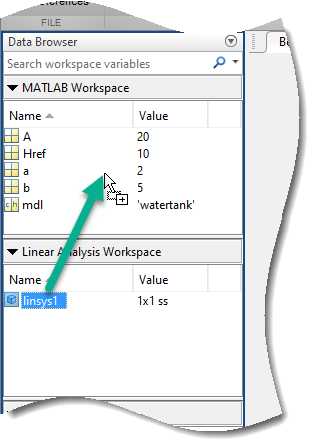 To open the Linear Analysis Tool, in the Simulink model window, right-click the Water-Tank System block, and select Linear Analysis > Linearize Block. In the Linear Analysis Tool, on the Linear Analysis tab, in the Analysis I/Os drop-down list, the software sets the I/O set for linearization to Block: Water-Tank System. 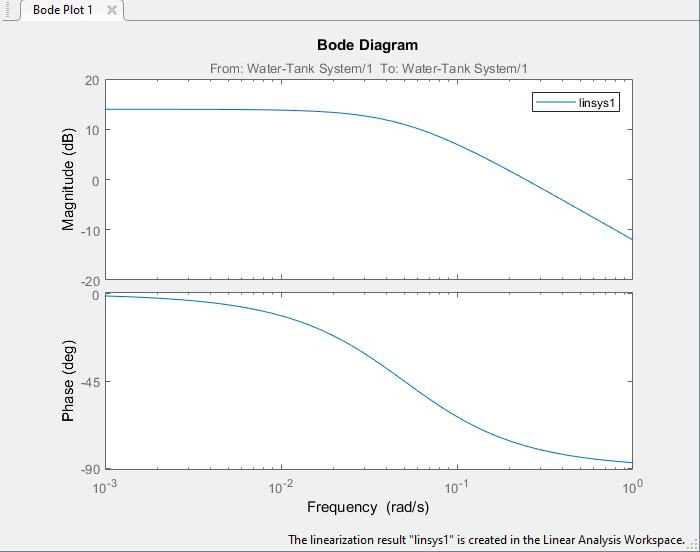 Alternatively, if the Linear Analysis Tool is already open for your system, in the Simulink model window, click the Water-Tank System block. Then, in the Linear Analysis Tool, in the Analysis I/Os drop-down list, select Linearize the Currently Selected Block. When the specified linearization I/O set is a block, you can highlight the block in the model by selecting the view option from the Analysis I/Os drop-down list. For example, to highlight the Water-Tank System block, select View Water-Tank System. For this example, use the model operating point for linearization. The model operating point consists of the initial state values and input signals stored in the model. In the Linear Analysis Tool, on the Linear Analysis tab, in the Operating Point drop-down list, leave Model Initial Condition selected. For information on linearizing models at different operating points, see Linearize at Trimmed Operating Point and Linearize at Simulation Snapshot. 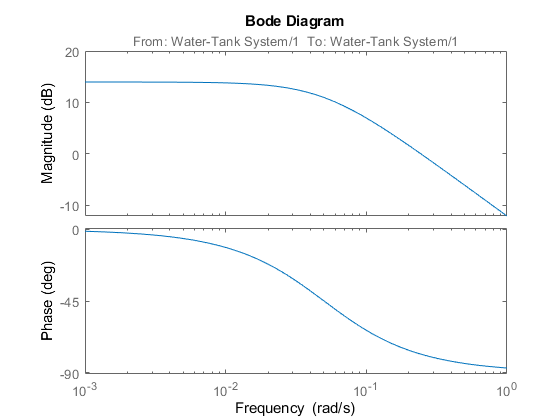 To linearize the specified block and generate a Bode plot for the resulting linear model, click Bode. The software adds the linearized model, linsys1, to the Linear Analysis Workspace and generates a Bode plot for the model. This example shows how to linearize a plant subsystem in a Simulink® model using the linearize command. For this system, the Water-Tank System block contains all the nonlinear dynamics. To linearize this subsystem, first specify its block path. Then, linearize the plant subsystem at the model operating point. The model operating point consists of the initial state values and input signals stored in the model. For information on linearizing models at different operating points, see Linearize at Trimmed Operating Point and Linearize at Simulation Snapshot.